Water can move a mountain. The movements of this Poomse should be performed like water. Sometimes standing still like water in a lake, sometimes thriving as a river. 19 Movements, 8 kicks, 7 punches, 2 keup. Ready stance (Joonbi). Moving your left foot, turn 90° to the left into a right back stance (Dwit Kubi). Execute a left double knife hand middle block (Sonnal Momtong Makki). Execute a right front kick (Ap Chagi). Assume a right forward stance (Ap Kubi). Execute a right middle punch (Momtong Jireugi). Moving right foot, turn clockwise 180° into a left back stance (Dwit Kubi). Execute a right double knife hand middle block (Sonnal Momtong Makki). Execute a left front kick (Ap Chagi). Assume a left forward stance (Ap Kubi). Execute a left middle punch (Momtong Jireugi). Moving the left foot, turn 90° counterclockwise into a left forward stance (Ap Kubi). Execute a left down block (Arae Makki). With the feet in the same positions, twist the middle to the left and execute a right knife hand neck strike and left open hand upper block simultaneously (Jebipoom Mok Chigi). Execute a right front kick (Ap Chagi) with the hands in the same position. As the kicking leg comes down, push off with the left leg and jump forward landing in a crossed stance, right foot forward (Dwi Koa Seogi). At the instant you land, execute a right augmented backfist to the philtrum (Kodureo Deung Jumeok Olgul Chigi). The left fist is held at the right elbow. Yell (Kihap). Moving the left foot, turn 270° counterclockwise into a right back stance (Dwit Kubi). Execute a left double knife hand down block (Sonnal Arae Makki). Shift the left foot to assume a left forward stance (Ap Kubi). 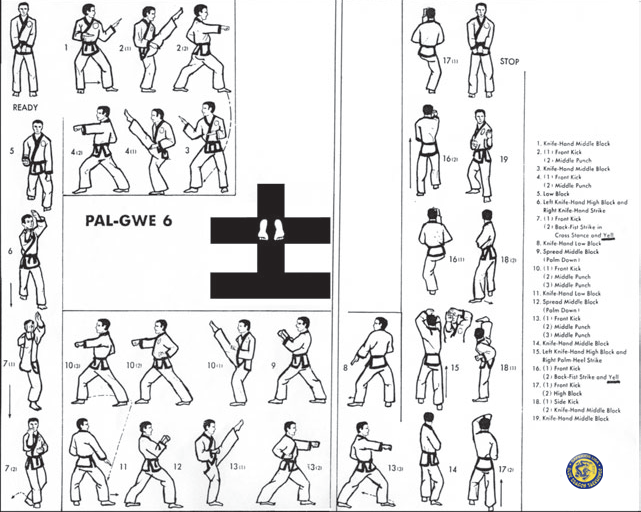 Execute a palm outward wedge block (Momtong Hecho Makki). Execute a right front kick (Ap Chagi). Assume a right forward stance (Ap Kubi). Execute a double middle punch (Momtong Dubeon Chireugi), right fist first. Moving right foot, turn 180° clockwise into a left back stance (Dwit Kubi). Execute a right double knife hand down block (Sonnal Arae Makki). Move the right foot, assuming a right forward stance (Ap Kubi). Execute a palm outward wedge block (Momtong Hecho Makki). Execute a left front kick (Ap Chagi). Assume a left forward stance (Ap Kubi). Execute a double middle punch (Momtong Dubeon Jireugi), left fist first. Moving the left foot, turn 90° counterclockwise into a right back stance (Dwit Kubi). Execute a left double knife hand middle block (Sonnal Momtong Makki). Shift the left foot to assume a left forward stance (Ap Kubi). Execute a right palm heel strike to the chin and a left open hand upper block (Jebipoom Teok Chigi) simultaneously. Execute a right front kick (Ap Chagi). Assume a right forward stance (Ap Kubi). Execute a right backfist to the philtrum (Deung Jumeok Olgul Chigi). Yell (Kihap). Execute a left front kick (Ap Chagi). Assume a left forward stance (Ap Kubi). Execute a left upper block (Olgul Makki). Execute a right side kick (Yop Chagi) toward 6 o’clock. Assume a left back stance (Dwit Kubi). Execute a right double knife hand middle block (Sonnal Momtong Makki). Pivot 180° counterclockwise into a right back stance (Dwit Kubi). Execute a left double knife hand middle block (Sonnal Momtong Makki). Ready stance (Geuman), keep left foot fixed, move right foot to the front.